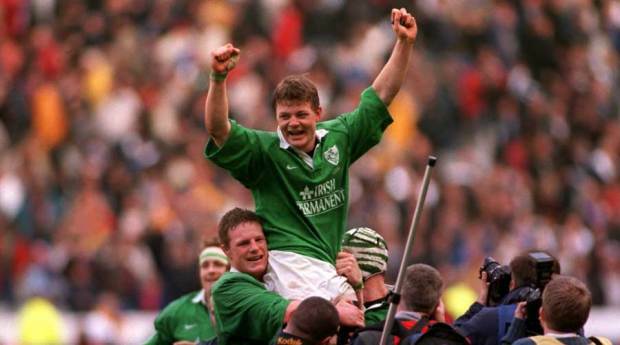 A young dasher named Brian O'Driscoll announced himself to the rugby world with a hat trick of tries that gave Ireland their first win over France for 17 years and their first in Paris since 1972. The inaugural Six Nations had been short of drama until this match, in which Ireland survived a breathtaking start by France, wrested the initiative from the hosts after half time, and clinched victory with a 78th minute penalty from 41 metres out. Keith Wood tried to portray Ireland as underdogs in the build-up. "The pressure will be on France," he told the press, "nobody expects us to win." What unfolded betrayed that he used considerably more inspiring words for his changing room team talk. 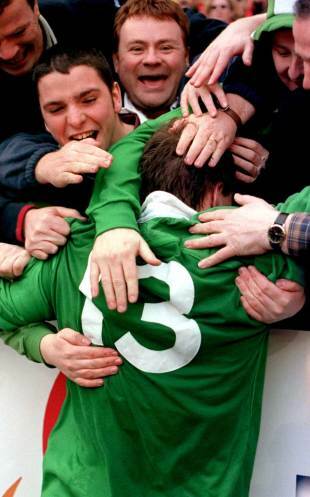 With convincing wins against 1999 champions Scotland and Italy already in the bag, this occasion represented Ireland's best chance to win in Paris for many years. Though France had reached the World Cup final four months previously, only four players made the starting XV for both matches. France were decimated by injury to at least nine first choice players, World Cup half backs Fabien Galthie and Christophe Lamaison being among four of the original selection to withdraw in the last days before the match. Regardless, the understudies were fully charged to run riot in the spring sunshine. Wing David Bory almost scored in the opening minute, Ireland spared by Cedric Desbrosse's final pass going forwards. Emile Ntamack chipped to the corner for a second chance, but Ireland held out. For all their derring-do, France scored only one try, on the half hour, but Gerald Merceron kept the scoreboard ticking with two early penalties and a further two soon after half time. This was a game full of purring, flowing movement and the home crowd loved it, at least until Ireland stole the French script and provided the flair later on. Having survived the early assault, captain Keith Wood led the charge, ably supported by his back row men, Anthony Foley, Simon Easterby and Kieron Dawson. Ireland's pack were heroic, showing greater stamina than the French, not least when replacement lock Paddy Johns was harshly yellow carded on the hour. This was not all traditional Irish forward fare, however, and young half backs Peter Stringer and Ronan O'Gara managed to set their three-quarters off with rare freedom. O'Driscoll, just 21, with floppy hair and baggy shirt flapping in the wind, crossed for tries in the 23rd, 58th and 74th minutes, showing mouth-watering pace and scintillating change of direction. His centre partnership with Rob Henderson was magnificent, each instinctively knowing what the other was doing and finding space in midfield. Gerald Davies heaped praise on the young man, "O'Driscoll gave as fine a performance in the centre as any player within recent memory, in all its roundness and awareness of timing and speed." Henderson and O'Driscoll gave France a dose of their own medicine. Henderson was the rock in defence and crashed forward when in possession. O'Driscoll provided the glamour, his deft footwork and speed taking him past tacklers before they knew it. He showed perfect balance to change direction firstly off his right foot, and secondly off his left, in the move leading up to his first try. Peter Clohessy recycled ball from a ruck just short of the line, the ball went right and O'Driscoll was in under the posts. Showing equal sharpness in defence and strength in the tackle confirmed O'Driscoll as the complete centre. France led 19-7 after 54 minutes. O'Driscoll's second try, beautifully created by Henderson, was converted by O'Gara and brought Ireland back into the game on 58 minutes. But France quickly stretched the lead again to 22-14 with Merceron's fifth penalty. Meanwhile, the experienced David Humphreys replaced O'Gara and assumed kicking duties. One more penalty apiece made it 25-17 to France with six minutes remaining, when O'Driscoll struck for the third time. The ball went loose when Stringer was flattened by Abdelatif Benazzi 25 metres out, he swooped to pick up and tear through a gap to his left, touching down without a French hand being laid upon him. One point apart as the clock wound down, it was France who transgressed as players went over the top of a ruck. Humphreys held his nerve to slot a long penalty and two minutes later a belated St Patrick's Day party erupted in Paris. It was an extraordinary result to a remarkable match. Brian O' Driscoll had arrived.